I regret planting these daisies in this perennial border. Oh, yes, they look nice in this picture, taken on May 22nd, but after being beat down by six inches of rain on Saturday morning, they looked bad. They looked so bad that I didn't even take a picture. Who wants memories like that? I'd been thinking already this spring that it was a bad idea to plant these daisies, which I am pretty sure are ox-eye daisies, Leucanthemum vulgare. On Sunday, I cut them all down to the ground and once the ground dries out a bit, I'm going to dig them all out and eradicate them from this garden bed. Then I'll put them on my ever growing list of "plants I regret planting". I don't even know if I foolishly started these from seed or actually paid good money for a plant! As much as these spread, I hope if I bought a plant, I only bought one. I really should follow my own guidelines for shopping for plants, especially the one about not buying a plant you don't really know a lot about. And I'll add another guideline to be careful if the species name of a plant is something like "vulgare". A name like that should have been a very obvious clue. I just hope when I bought it, the botanical name was something different, since I think this daisy once started out life as Chrysanthemum leucanthemum. Oh, and don't assume that just because someone is selling these daisies that they are okay to plant in your garden. They might be okay to plant, if your garden is really a meadow and you want something that self-sows all over the place and wants to take over. Do you have any plants that you regret planting, that you are willing to admit you planted? 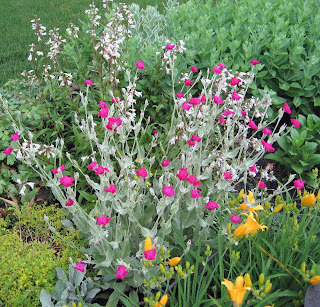 The rose campion flowers in this picture are a nice bright spot on an otherwise dreary evening. I know some gardeners consider these invasive, but so far, I've been able to control them and easily dig out those that seeded where I didn't want them, unlike those poorly behaved daisies who tried to take over an entire perennial border when my back was turned. By the way, Garden Bloggers' Bloom Day is on Father's Day this year, but hopefully with some advance planning, people will still be able to find time to post about their blooms in-between Father's Day activities. It's easy to participate in bloom day, just post about what is blooming in your garden on the 15th and then leave a comment on my bloom day post so we can find your blog and come by for a 'virtual visit'. All are welcome to participate. As I start to catalog my plants, I know I have some mystery plants that I don't have a positive, exact id on. Here's the first of them. I know this is an evening primrose, Oenothera sp. It started to bloom last week, I think. Unlike the pink-flowering Oenothera speciosa which spreads, this one has formed a nice clump about three feet across and three feet high after five or six (or more) years in the same spot. It dies down to the ground each fall. The picture above is of it blooming on a sunny evening. This picture below was taken this evening, after it rained, to show the slight variegation or mottling on the leaves. In the past, I've had people comment that this might be O. missouriensis, but I don't think it is. If you think you know which primrose this, I'd owe you one if you'd tell me! In spite of a late afternoon rainfall of an inch or so, I did manage to get out to the vegetable garden to pick more strawberries and also "spoon" some of the smaller cucumber seedlings. They looked 'vunerable' to rabbit munching. 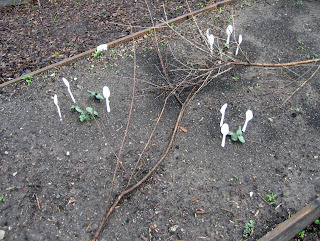 I'll admit the garden looks a bit odd with all these spoons sticking up all over the place, plus branches laying across several beds, but I'll have the last laugh if all this keeps the rabbits from eating and the cats from digging. Now that I look at this picture, I don't think I have enough spoons around these to protect them completely. But it may be enough because so far, the spoons seem to be protecting the green beans. I've also had some people comment about how nice and straight my spoon rows are around the green beans. Yes, are they in nice, straight rows. I don't know why I put them in like that, that's just the way I do things, I guess. Can you imagine the extra thought I have to put into planting when I don't want the plants in nice straight rows? Carol, I have to laugh ever time I see those spoons, bet hey...if it works. I planted false sunfllower and english ivy, can you imagine! I have spent a ot of time trying to get rid of or control these. Good luck with the rabbits. regrets....where to start? Snow on the Mountain or its other more fitting name: Goutweed... it should be banned from the planet. And Chinese Lantern. I really do like the little lanterns but this plant is a thug. I can't get rid of it! 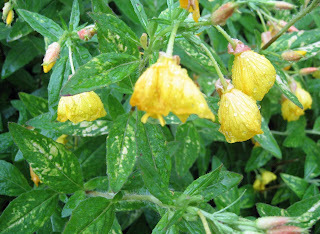 I don't remember its name, but it has a feathery leaf and yellow flowers and my gardening expert sister gave it to me. Also, lemon balm and hollyhocks. I like hollyhocks, but they just tried to take over. You know that zebra grass you gave me? That is a beast, isn't it - LOL! I might have to borrow your spoon trick....the cats have taken to napping in the middle of the pepper bed destroying 3 or 4 of my pepper plants. I hope it's not too late to find good pepper plants because it looks like I'll be replanting -- along with a few spoons. Your evening primrose looks like one given to me with the name given as Persian primrose. I know that might not help as it isn't the botanic name but that is all I had on it. As to regrets...When I am pulling fists full of mint out from one of the beds I am sorry. When all of the cleome seeds are sprouting when I don't want them I fuss at myself. I knew that both were invasive but I like them anyway. Malva alcea 'Fastigiata' It has been removed from the flower bed for at least 2 years, and still seedlings come up every year. They have tap roots, so if one hides amongst bushy perennials and you don't find it until it is 2 feet tall and about to flower, you have your work cut out for you trying to extricate it from the good plant it is growing right up against.
" . . . don't assume that just because someone is selling these daisies that they are okay to plant in your garden." Amen to that. These plants were sold by White Flower Farm when I bought mine--a whole 6 pack from Bluestone Perennials. It's possibly Oenothera fructosa...is the base a sweet rosette? I read you can dead head it and keep it blooming but I haven't had luck with that! Regrets, I've had a few...letting the Japanese anemone take over a few spots! My most regretted plant is a campanula. I don't know what variety, but it spread aggressively underground and seeds itself everywhere. One year I think it is gone, only to pop up somewhere else. 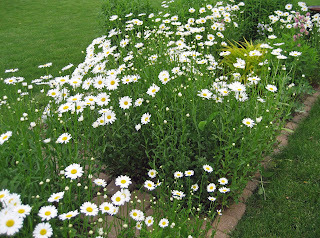 I have oxeye daisies too, but they are volunteers. They showed up one year and I just don't pull them out. I so love daisies. Maybe some year I'll regret not pulling them, but not yet. The daisies I have are the dickens to dig up. I've been able to remove some of it but not all. I couldn't believe all of the rain we got yesterday, last night and then again this morning. I'm ready for some decent weather about now. I have those primrose, too! They -- along with everything at the new house -- are plants that I have no idea what they are. They were beautiful when they first bloomed, but now, like your's, are very sad. I need to have someone like you come out and tell me what everything is and how to take care of it. I personally haven't planted one, but I tried for 3 years to get rid of a yucca plant at my old place....they are the worst! Hydrophyllum virginia & Asclepias syriaca. Both natives, but both way to aggressive for my garden. The Hydrophyllum, an Olympic-class seeder, was mismarked & I got it at a garden club sale in town. (I don't go to that sale anymore, it's just a bunch of aggressive plants that their owners have to keep digging out.) At least I didn't pay for the Asclepias. It turned up in my mom's garden & she was going to weed it out (smart woman). It spreads by very large, very deep underground runners. I'm trying to kill it with weed killer. The one flower I regret planting is Obedient Plant. It was the pink variety. Obedient it is not. It should be call Naughty Plant. :) It spreads underground so it is hard to remove. I like the flowers though so I saved some and planted them in a large wash basin I have in the garden. This is the only way to have it in the garden. An alleged friend gave me the magenta Phlox paniculata, saying that it did tend to spread. Rampage through the bed is more like it. It seeds, it runs, it laughs in my face as I'm digging it up! Also in that bed are the pink evening primroses, which look deceptively sweet but have similar growth habits. Interestingly, the ox-eye daisies do not run rampant for me. Thank goodness for that! 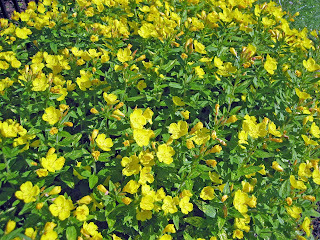 I do like your yellow primrose, any plant that has a mounding appearance is on my to have list. Oh yeah, Oenothera speciosa is probably the one I most regret planting. It took me a couple of years to start hating it and by then it had taken all the empty space around it and then some. It should have been so obvious by that time, but.... sheesh!